Tagged under Abec, A-1 Pictures, Series, Light Novel, Games. 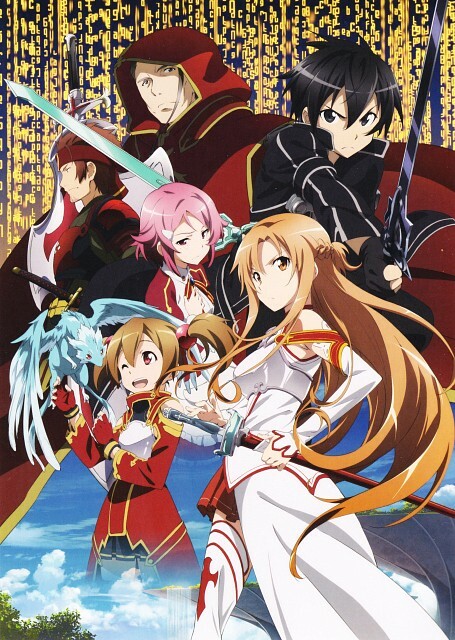 The series follows Kazuto Kirigaya as he signs into a MMORPG called Sword Art Online, under the name "Kirito". The creator of SAO informs him and all the other players that they are trapped there and that should they die in the game, they will die in real life as well. Having been one of the 1,000 beta testers, Kazuto feels that he can go at the game alone, but later on realizes that he needs others just as much as they need him. Sword Art Online is a classic example of a show that's easy to watch, easy to enjoy, and, especially for those who are fairly new to anime or don't take a show beyond face value, easy to mistake for the amazing series it tries to be. Yes, therein lies the primary problem with Sword Art Online. It tries to be the ultimate anime experience, with a little action adventure here, a little romance there, with filler and thriller in between. And instead of becoming one of the benchmarks for modern anime like Madoka Magica Kara no Kyoukai or Fate/Zero it becomes more or less a collection of many different cliches, tropes and archetypes, with the only amazing qualities being the art the action and it's gripping introduction. Very good animation. Nice characters and a good story with great battle scenes. Peaceful and emotional events arent coming too short. There are parts where you feel with the characters and let your heart pounding. Kirito and Asuna part was very beautiful, too. Well, that goes for the first half. The second half was weaker than the first half. Less fun, less action and a story which couldnt reach the highs of the first half. The battles were good but had less impact... and then there are some ugly parts here too (which I think werent necessary...) ... new art style cant keep up either. I missed Asuna. Kirito had better days. Villain was...__ At least it had an OK-conclusion. When ignoring this half, a very great series. Sword Art Online is one of the best anime I've ever seen so far. Storyline is really amazing especially the first half of Season 1 which had an epic ending for the main characters. However, story became quite predictable in the second half of Season 1. Next, people can also learn from this story and you would know what could it be. The OST's are pretty good and especially the BGM A Tender Feeling, when Kirito and Asuna express their affection and love to each other which I find really magical and amazing. Worth the watch and will be expecting more than less in the next seasons and of course the movie. This anime was perfect in the first half of the first season. It had you on the edge of the chair, biting your nails, ripping your hair out in anticipation, not knowing what could happen to those great characters you follow through the VRMMO of SAO. Once they got out of the game and ran into trouble with Alfheim Online, the story took a turn for the worst. There was nothing to keep you watching, except for the season finale. I can only hope they bring back everything I loved of the first part of the story. So far, they are doing a good job. The story is based on survival in a virtual game. if you die in the game, you die in real life. The story is very emotional and you become attached to characters very quickly. First season was meh. It started off amazing and although I thoroughly enjoyed many parts of the series, I can't reward it with a good score because of how bad some aspects were. The second arc was pretty bad and too many things seemed setup. Just started season 2. First episode was alright. We'll see how the show works out. Premise seems interesting and I've heard that the GGO arc is one of the better ones in this series. My friend suggested this anime to me because he said that its awesome, so I watch it. For me this anime is just fine for me very good art and design, also has a good characters and backgrounds.. The idea of the whole series is very interesting.. Most of my classmates likes this series very much, but I don't like it very much. This anime is just above average and it is very worth watching.. This feels like a variation of the .hack// universe. It's entertaining, but doesn't feel entirely original. To be able to game via a neural interface-like helmet is quite a scary thought. There are more health implications than possible benefits from the gaming experience. I have some issues with this anime... I hate Asuna, so I couldn't be "neutral" when I tried to rate the series. I think she's kind of hypocrite because she wants to assure that she's strong and then when she has problems with another guys, she needs Kirito's help... Forgetting that, it's interesting. Anyways, I would like to read the novels. Speechless, I loved. Because it combines video games and action, with the love between Kirito and Asuna. The end of the first season made me cry, but then at the end of the season I was happy because It finished well. Warrior and brave Kirito, which gave all of himselfe for Asuna. I loved that, very tender. The truth is that its a great Anime. It is one rocking anime from the first episode itself it arouses our interest and every episode is interesting and fun. Kirito the main protagonist is cool in his own way and I like her younger sis she's cute, Asuna is quite the character strong and dignified. It was a cool anime. awesome setting awesome telling awesome main character awesome story is there anymore to say? nice anime beautiful storyline and events, very beautiful graphics the only main character is beautiful, but other silly characters (the girls that Kirito have met) is just waste of time, and a big trouble too !! any way the battels is so cool !! and the main anime idea is new and very exciting anime although i thought it's gonna be a boring anime! the storyline of this anime is new an very excited,i liked this anime and i enjoy watching it, another reason i like this anime cuz it's idea about games and i like everything about games, Asuna and Kirito are amazing characters, the graphics and colors of the anime is more than great,the battles are awsome,the only thing i hate is the other female characters, i hate them very much (except Yue), however, i really enjoy this anime.